Throughout my twenty-five year art career, I have worked with 35mm film alongside my abstract painting and sculpture. Within the past ten years, I have been working on abstract methods to create photographic images that appear painterly and at the same time hold up as photographs. Using SX 70 and 600 Plus Polaroid film, I manipulate the images I photograph as the film is developing, thus creating abstract effects with line. I push the image further by oil painting onto the Polaroid surface. The combination of the line drawn with a pointed instrument which changes the surface of the photograph and loosely oil painting over selected areas allows for an original multi-image. When I first started this process, I was doing self-portraits. Friends started asking me to do portraits of them and I began the business of ‘Art in Your Face’. Later I started to paint historical towns, landscapes and commonplace objects which became cards and a means to support my painting and sculpture. 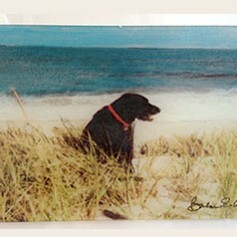 My first book of painted Polaroids, called Dog in the Dunes, published in 1998 by Andrews McMeel, is a series of forty painted Polaroids of my black Labrador during an artist residency in a dune shack on Cape Cod. Fields Publishing has republished Dog in the Dunes, as Dog in the Dunes Revisited in the spring of 2005. Fields Publishing is based in Provincetown, MA, the hometown of Dog in the Dunes. This new printing is an expanded addition of painted Polaroids and larger in size from the original. New York Love Affair, published by Fields Publishing, May 2010, is a photographic ode to a world-class city, the everyday yet oft-remembered sights of the Big Apple appear through the lens of manipulated, painted Polaroids. Locally, Barbara’s work is currently being shown at AMP, in Provincetown. She can also be found at Galleries in NYC. 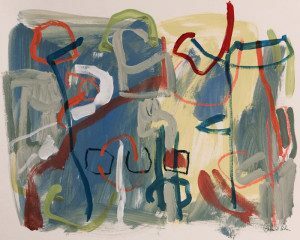 Find more of Barbara Cohen’s work by visiting her website.